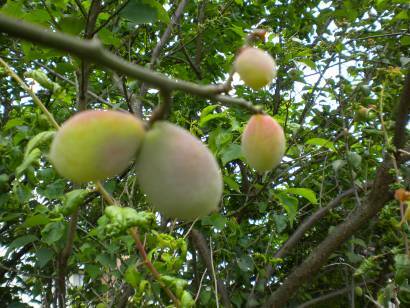 Japan Farmers Markets: Here Come the Plums! I'd like to say this photo is blurry because the ume were growing so fast I couldn't get a good picture, but that would be a lie. I was rushing about last week doing a last few things at the farm and in the garden before our trip home to Michigan. We'll be home there for one week for family reasons, but as I've said before, vegetables wait for no one. And, clearly, that goes for fruit, too. Ume (Japanese plums) are tart, lovely, and preserve well in so many ways. This little fruit has opened a door of flavor for me, not to mention my closet full of shus (just search the word on my blog and you'll see), that I have a great deal of affection for it. Below is a list of links to peruse and choose what you might like to do, too. Let me know. I'm sure there's something with this little lovely I've not thought of that ought to be tried. Umeboshi - The classic preserve in Japan with a flavor like no other. A little work, but well worth the effort. I should also add that it's not as difficult as it seems at first. Umeshu - The classic liqueur in Japan that tastes best after at least two years...if you can wait that long, that is. Ume Hachimitsu - A lesser known beverage that is a household favorite for us. Good hot or cold, and pathetically easy again. Ume Hachimitsu Jam - Mottainai. I couldn't just let those leftover plums go to waste, could I? I recognized the word "ume" from some of your other posts -- but it was only today that I made the connection that it was a type of plum!